Step by step TS ITI Courses Online application form submission 2018, How to Apply for Admissions into I.T.I.s, ITI Telangana courses online applying process, Telangana ITI Course online application form filling instructions, TS ITI Courses Online admissions 2018 notification/ Telangana ITI Online admissions 2018/ ITI Telangana Online admissions/ Last date for submission of ITI Online application forms / Seat allotment Letter/ IITI Selection list results and Merit list: The applicants are advised to read all the instructions carefully. Also refer the User Manual available in the website. For further assistance, contact the helpline +91 7997973364. The applicants shall keep Aadhar Card, Candidate Mobile Number, Candidate E-mail Address, Scanned copy of latest passport size Photograph, SSC memo or its equivalent, Caste Certificate and other certificates if any etc. ready before Applying for ITI admission. The process of submitting application comprises of the following steps. 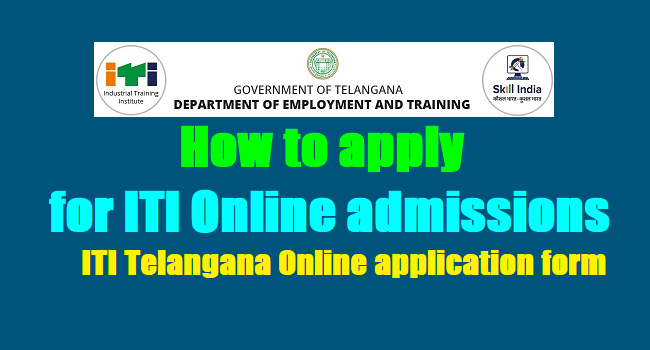 ii) Filling of online Application. iii) Exercising options for ITI and Trade. 4. Enter Mobile number and E-mail ID to register. 5. Password will be sent via SMS to the Registered Mobile Number, immediately, it should not be shared to others under any circumstances. 6. Mobile Number will be the Candidate’s Login Id to submit online Admission application. 7. After logging in, click on “Apply”. 8. For “Qualification” entry, select appropriately from the drop downs (10th Pass or 10th Fail or 8th Pass). 9. Select Name of the Board, Month & Year of passing from drop downs. 11. Owing to any reasons, if the details are not captured from the database, enter all the above details in the Online Application form. 13. Enter Aadhaar Number, address and other details. p) Select the Reservation Details from drop downs. e. Ex-Serviceman (Yes or No). 14. After entering the above details, click on “View & Save”. 15. The applicants are instructed to get a “Print-out” of filled online application and ensure that the particulars are correct in all respects before final submission. If any of the particulars are found incorrect, edit the application, accordingly by using “Edit” option. After successful submission of Application, the candidate will be allowed to submit options for selecting ITI and Trade in preferential order. Please click on “Seats Open” on the menu bar of the website for the seats open for the session August 2018 in various ITIs. In personal Details, all the mandatory fields should be accurately filled with candidate photo. Candidate reservation details like religion caste etc. should be entered.